There are some incredibly funny moments sprinkled throughout Ted 2, and if you’re after laughs and crude jokes you’ll likely be satisfied with what you see on screen. With MacFarlane, you know what you’re going to get, broad stoner gags, pop culture jabs, and his standard oh-my-god-I-can’t-believe-he-just-said-that humor designed to push your buttons. Which basically means that for every clever bit, you get as many groan-inducing racist, sexist, homophobic, and transphobic hits, and any charm of them being delivered by a talking teddy bear has worn off by now. By this point you’ve seen what MacFarlane has to offer, you either like it or you don’t, but either way, here it comes across as rehashed Family Guy jokes. It’s not even shocking, at this point it’s just bland and boring. It doesn’t help matters any that Ted 2 is more a series of wacky hijinks stitched together than a story. Picking up where the last movie left off, John Bennett (Mark Wahlberg) is now divorced and sad, and his bestest buddy, the anthropomorphic teddy bear Ted (voiced by MacFarlane), marries his trashy sweetheart Tami-Lynn (Jessica Barth). When they decide to adopt a baby to save their failing marriage, which is nothing more than a plot point, they learn that legally Ted is considered property. John and Ted then embark on a quest to have Ted declared human, and along the way John falls for big-eyed lawyer Sam Jackson (Amanda Seyfried). Somehow this simple, completely vanilla plot is stretched to damn near two hours. Tediously overlong, Ted 2 is full of unevenly paced scenes that have no business being left in the movie, and just when momentum is moving along at a nice clip, everything comes to a screeching halt with some minor aside. An ill-advised trip to New York serves the sole purpose of getting the gang to New York Comic Con so MacFarlane can drop countless references. There’s a painfully bad subplot with Donny (Giovanni Ribisi) from the first film plotting with a toy manufacturer that is completely superfluous. It adds nothing to the movie in any way except wasting time. The fact that the whole quest is framed as a civil rights issue, repeatedly comparing Ted’s situation to slavery, also leaves a sour, creepy taste in your mouth. Ted and John have the same relationship and chemistry that they had in the first film, but while there are moments of sweetness and connection—Ted 2’s highest achievement is that you, once again, forget that half of the main duo is a talking toy—their Southie banter not enough to carry the movie. Having a baby to save a marriage is, of course, a terrible idea, and Ted and Tami-Lynn’s marriage is so caustic and toxic that it’s hard to root for them as you watch them fling verbal abuse and dishes back and forth at each other. John’s connection with Sam is forced and generic and entirely predictable. There’s nothing more to it than a shared affinity for getting stoned out of their mind and they’re both physically attractive. They don’t have to overcome anything more than John’s reluctance to ask her out. With all of the courtroom drama there’s a running Law & Order gag throughout, and from a stylistic standpoint, Ted 2 is like watching an especially crude episode of the procedural. There’s nothing particularly cinematic about film, and it’s shot like any standard network TV show. 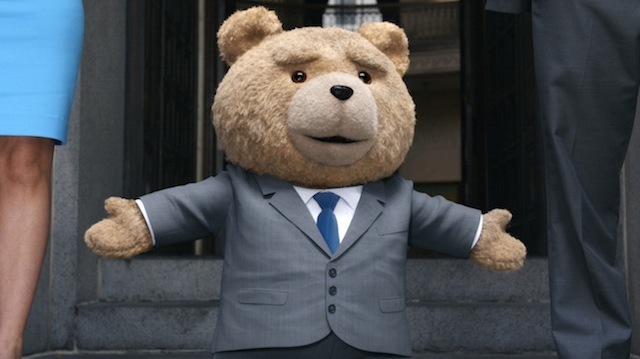 Ted himself looks perfect, the motion capture animation blending seamlessly with the live-action elements. Especially if you’ve seen the first film, this is just normal, which makes it all the more impressive.